This unique ergonomic drum transporter requires less than 45 lbs. 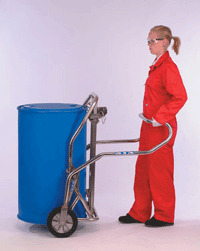 of force to manually lift a full 55-gallon drum weighing 660 lbs. A single operator can move heavy drums effortlessly and safely. The drum is automatically engaged with a multi-adjustable catch that latches on to the top lip of the drum. Just depress the foot bar, pull back on the handle and the drum is elevated straight up off the floor. In this position the load is balanced and there is virtually no load on the operator. Tires are made of mold-on rubber over cast aluminum hubs.